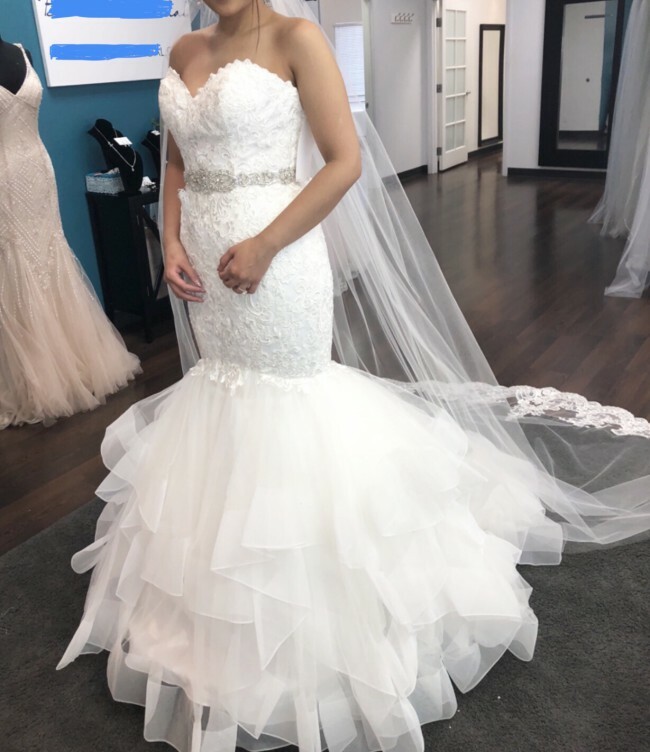 BRAND NEW, unworn size 8 Maggie Sottero dress! Beautiful all Ivory lace wedding gown with gorgeous train. The back is a low back cut with classic buttons but also zips up. The pictures does not do it any justice because it isn’t my size. The dress is two size bigger on me. Im usually a US 2, size 4 in wedding gowns. This dress is a Maggie Sottero size 8. One of the pictures (primary photo) show the dress more form fitting because we put a belt on it (does not come with belt). There are no alterations done in the dress whatsoever. It is left preserved in an opaque garment bag. Took a different turn, so here I am selling this beautiful dress. I got this dress for retail $1350. Selling it for only $1200. *Price is negotiable! (I know how expensive weddings can be). The dress comes with the garment bag, extra buttons, and tags still attached. PS. The dress is so light I can dance around in it, with no problem. Thank you for your interest. Contact me for questions and more details.